Following on from their previous successful Kickstarter headphone campaign back in 2012 Ohad Einbinder and team have now launched a new campaign for the Boomphones RE-UP headphones. The unique Boomphones RE-UP headphones come with a carry case that incorporates a portable speaker system for when you would like to share your music with others. Check out the demonstration trailer below to learn more. 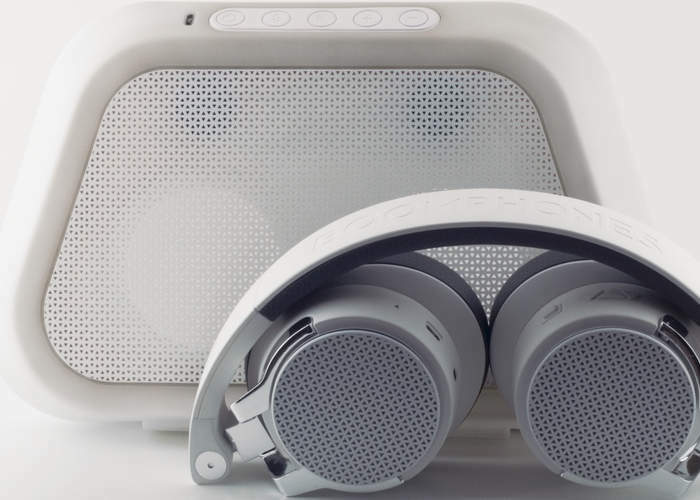 In 2012, Boomphones brought you the Phantom, the world’s first headphones that transform into a boombox. Introducing the Boomphones RE-UP, an evolutionary leap in portable audio technology. In addition to turning from a headphone to a speaker with the push of a button, The RE-UP is the only Bluetooth headphone-speaker hybrid that uniquely folds to become its own speaker stand. We’ve even taken things a step further with the Active Speaker Case. Besides protecting your headphones, the case will enhance your listening experience, due two additional speakers built right into it. A protective headphone case with two built-in speakers as well as its own battery. You can also charge your headphones or smartphone with the case’s charging port. For more information on the new Boomphones RE-UP jump over to the Kickstarter website for details and to make a pledge from $150.